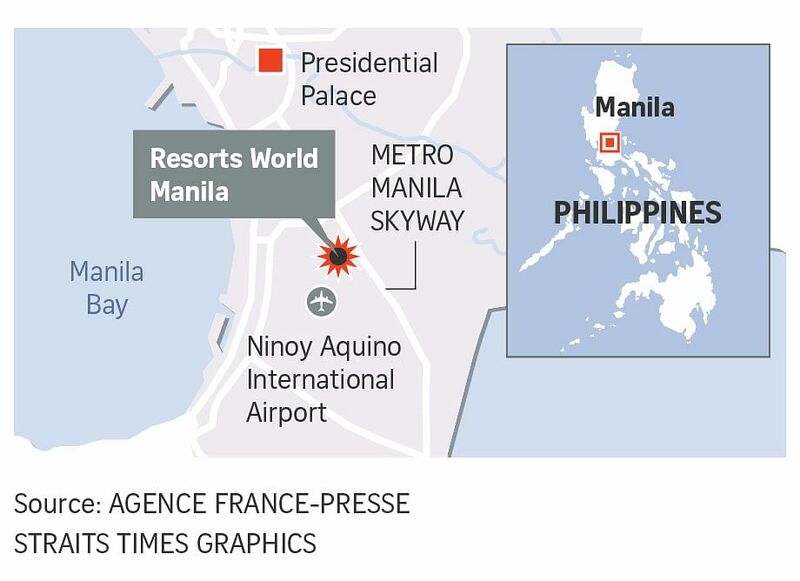 MANILA - At least 37 people died, most from suffocation, after a gunman burst into an upscale casino-hotel in Manila early on Friday (June 2), fired an assault rifle and set tables alight, in what was initially suspected as a terrorist attack. ISIS on Friday claimed responsibility but police said it was just a robbery gone wrong. Among those who died was the attacker, who was found severely burned inside a room at Resorts World Manila with a gunshot wound in the head. Chief Superintendent Oscar Albayalde, police chief in metropolitan Manila, said the man, whom he described as "caucasian", apparently ran inside a room on the fifth floor of the hotel, poured gasoline on himself, wrapped himself in a blanket, set himself on fire, and then shot himself in the head. Mr Albayalde said apart from the gunman, all of those who died were at the gaming area, which was engulfed in black, thick, acrid smoke. He said investigators were looking into why the sprinklers apparently failed. Albayalde said the suspect was "apparently mentally disturbed". "That's why we cannot relate it to terrorism, because he didn't shoot anybody. He didn't hurt anyone. He just went inside, burned the gaming tables. What he shot at was the doorknob of a storage room where the chips are kept," said Mr Albayalde. He said CCTV footage showed the suspect alight from a car at a the second level of a parking area, make his way to the casino carrying an M4 assault rifle and lugging a backpack, with a bonnet on his head. A female guard who saw him approaching panicked and ran, triggering a stampede, said Mr Albayalde. The man then fired at the ceiling and a TV, poured gasoline on a table, lit it up, and then fired at the door leading to a storage area for casino chips. He then stuffed his backpack with chips worth 113 million pesos, and then attempted to escape. Mr Albayalde said the suspect had yet to be identified, but suggested that he was likely a foreigner. "He looks caucasian, talks in English. He's big, and he's white. So the assumption, he speaks English, is he is probably a foreigner," he said. "What we've identified so far is the owner of the car he used. We're following up on that," he added. The attack stoked fears of a terrorist attack, amid days-long clashes between government troops and Muslim militants in a key southern city. Mr Albayalde said witnesses reported hearing men shouting, "ISIS! ISIS," referring to the Islamic State in Iraq and Syria. "What is emerging is that when people were scampering, they were the one shouting, 'ISIS! ISIS! People ran, and they quickly assumed it was ISIS." Unverified posts on the social media app Telegram said "lone wolf soldiers of the Khilafah attack the heart of the Kufar in Manila". The SITE Intelligence Group, which monitors terrorist networks, was then quoted by Agence France-Presse as saying it was an ISIS attack. Later on Friday, ISIS' news agency Amaq said the group has claimed responsibility for the attack. "Islamic State fighters carried out the Manila attack in the Philippines," the news agency said. But Director-General Ronald de la Rosa, the national police chief, said such claims were "nothing more than propaganda". Security officials said they have not come across any threat of a terrorist attack in the capital. Mr Albayalde said the police had been on its highest alert level since a night market was bombed in Davao City, President Rodrigo Duterte's hometown, in October last year (2016). "We have not downgraded our alert level since then," he said.